There was a lot of excitement at work this past week. On Tuesday, we had the Android open-source launch. On Wednesday, the G1 launched (there were lines at stores; that's all I was hoping for :o). 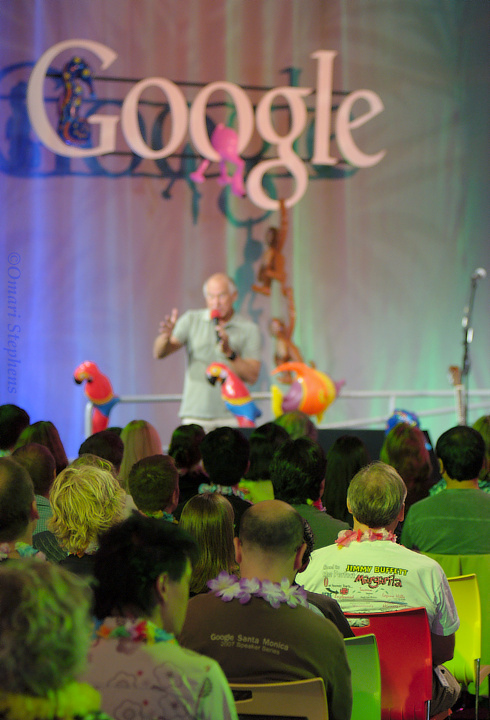 Then on Thursday, Googlers were serenaded by one Jimmy Buffett, during a quick stop on his "The Year of Still Here" tour. He talked some, played a short set with two Coral Reefers, and then spent the rest of the time answering Googlers' questions, both from the audience and from abroad. Here, Buffett chats with the audience after the band's final song. 1/80s at f/2.8 and ISO640. I'm really proud of this photo. It's excellently-composed, and it sort of demonstrates that when you try to notice things, every once in a while, things will work out. Which is reassuring, since I try to notice things a lot, and sometimes things just don't seem to come together. 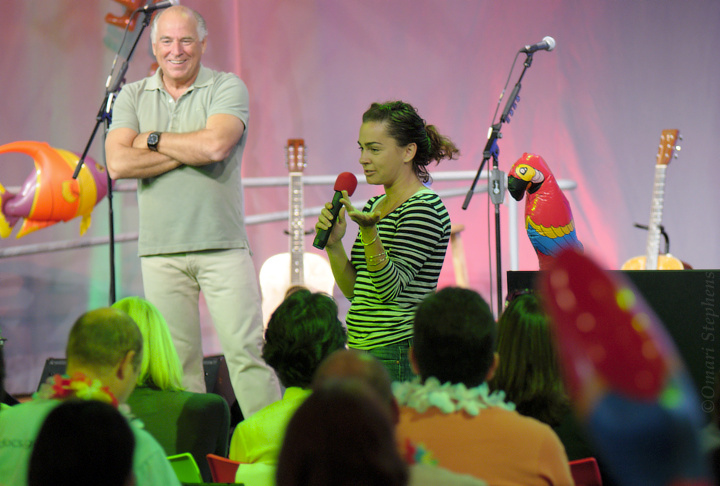 Regardless, this photo can certainly stand on its own (even without a caption), which is tough to do: you know what's going on (some guy is talking, and possibly performing, given the extra mic), you know who that guy is (Jimmy Buffett), and you know where Jimmy Buffett is doing all this (Google; not Google Santa Monica, though). And it captures important aspects of the environment — there are palm shadows on the backdrop; there's sort of a fun atmosphere with the blow-up animals; and there are parrots. Anyway, yeah, I think this one turned out well. The set was short, but enjoyable. 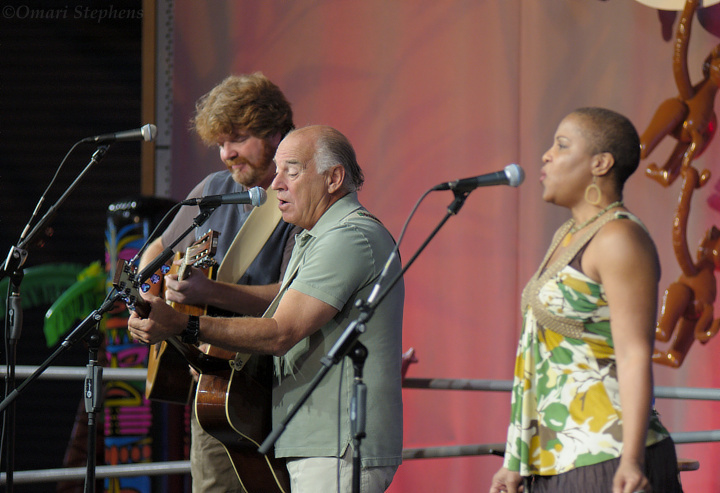 Buffett played with Mac McAnally (to his right, on guitar) and Nadirah Shakoor (to his left, on vocals). As an interesting aside (thanks, Wikipedia), at one point Shakoor was apparently the lead female vocalist of Arrested Development, a group that certainly helped broaden my musical experiences as a child. My dad had their album 3 Years, 5 Months & 2 Days in the Life of…, which we would listen to frequently in the car. Their song "Mr. Wendal" was likely one of the first social commentaries I listened to and began to understand the lyrics of. As far as Thursday's performance goes, though, I only remember the name of one song — You see, I'm only an apprentice in the ways of being a Parrothead. 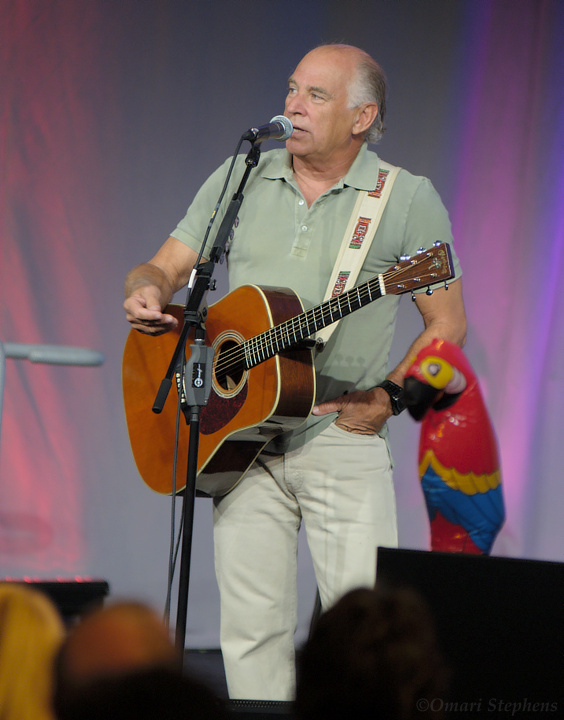 The song was "Margaritaville" and the performance included the Lost Verse. This was 1/100s at f/2.8 and ISO640. Buffett talks a lot during his performances. This is a style that also carries over to his albums. For instance, I acquired Far Side of the World album sometime around April of 2002, and the beginning of "Autour du Rocher" consists of Buffett chatting about a hotel in St. Barts. One difference I noticed is that on the albums, Buffett talks above a quiet musical background. At the concert, though, he'd pause every now and then to play a few quick chords before he kept talking. Cool. I shot this at 1/100s and f/2.8, at ISO640. In response to a question about being a Dad as an old guy, Buffett handed the mic over to his daughter Savannah Jane, who related what her childhood was like with a traveling Dad. She noted that when he was home, he always made pancakes, and so she tended to think of him as "that guy who makes pancakes." I like this photo. I specifically tried to get the guitars in the background, and I think it turned out well. I also think the expressions are pretty telling. This was 1/60s at f/2.8 and ISO640. After the performance, Buffett came off the stage and had more personal interactions with members of the folks in attendance. It was sort of tricky to get a nice shot, since at first the lights were still down and I was still figuring out where to shoot from (oddly, I'd move around and somehow Buffett managed to keep his back to me :o). After that, the folks sort of in the middle of the line wanted photos, but didn't seem all that interested in talking or interacting with him (or if they did, the actual interaction was very brief). As one of my interests is capturing people's emotions and interactions, I was specifically looking to grab the moment when Buffett and fan were displaying actual emotions, rather than fake smiles for a camera. In short, I think this photo is exactly that. 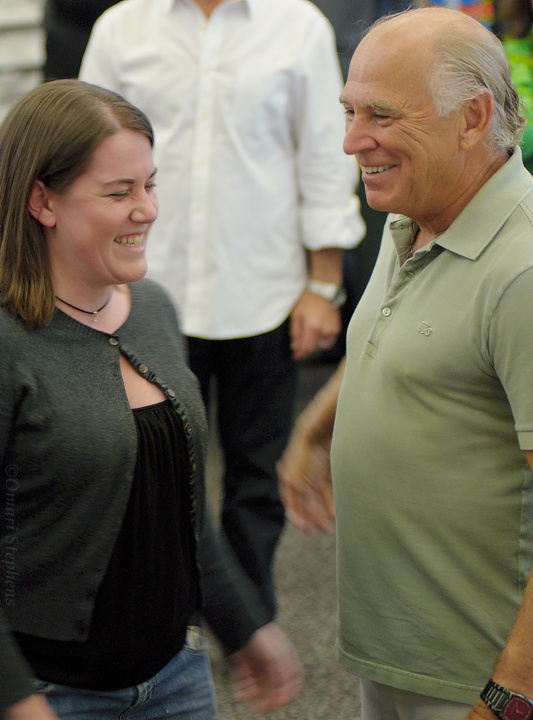 The woman is clearly giddy, and Buffett seems to be enjoying the interaction as well. I really like that they're sharp, but in motion. If I were to say "Here, Jimmy Buffett and an excited fan get together for a photo," it's blatantly obvious that that's exactly what they're doing. 1/40s at f/2.8 and ISO640. Well, that's so-long to Mr. Buffett. I have accrued quite a few photos that I'd like to share over the past week or two, though, so expect another post soon (by tomorrow? who knows?). To conclude, the Arrested Development aside really goes well with this quote from George Bernard Shaw: "If you have an apple and I have an apple and we exchange apples then you and I will still each have one apple. But if you have an idea and I have an idea and we exchange these ideas, then each of us will have two ideas."